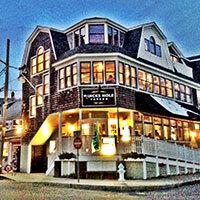 Set against a picturesque Cape Cod backdrop of sun-kissed docks and surrounded by timeless boats, The Captain Kidd Restaurant and Bar is a century old eating and drinking establishment located in the charming village of Woods Hole, Massachusetts. 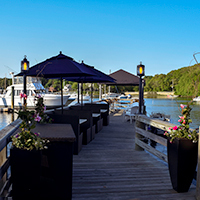 During the in-season summer months, relax and enjoy spectacular views of Eel Pond Harbor from any one of the comfortable indoor or outdoor dining areas. Sample something from our extensive wine list, and delight your palate with some of Chef Frank Belfiores creative dishes, including the freshest sea food from the raw bar. Select one of our 12 beers on tap and experience outstanding service and entertaining nightlife. The professional and friendly staff will take great care of you as you enjoy our hand crafted cocktails and quality cuisine. Serving lunch and dinner 7 days a week.